I knew an elderly widow lady when I was growing up, and she borrowed just about all of my L.M. 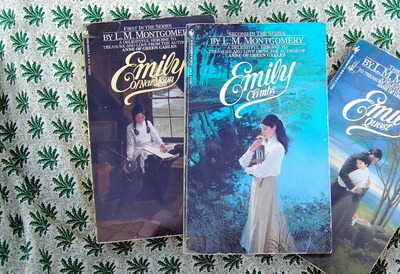 Montgomery books. I would bring one or more to church and give them to her. After she was done reading them, she gave them back with her initials, “LC” written lightly in pencil, in the back cover of the books. She had snow white hair, the picture-perfect little old lady, and lived all alone in a big, quiet farmhouse, using just a few of the rooms. Can you imagine her quietly reading? Maybe sitting in a “dressed” heavy rocking chair, the kind that has a thick afghan over the back, and a nice comfortable cushion in the seat? Or maybe it was a recliner by a sunny window, or the kitchen table, or her bed. 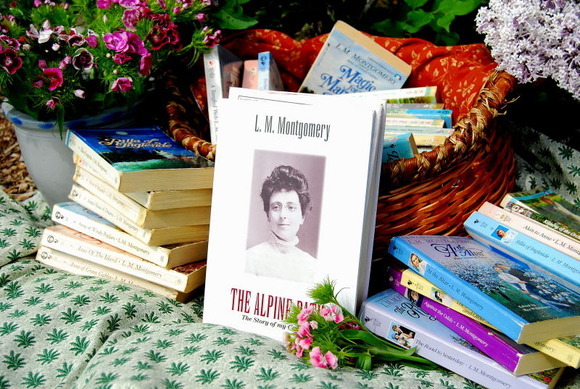 Wherever the place, she did read them, and sat alone in her house, passing the hours away with some of the best fiction books anyone could enjoy. . . .
You are never too old for Anne, or any other of L.M. Montgomery’s girls. I found my first Montgomery book in the library. 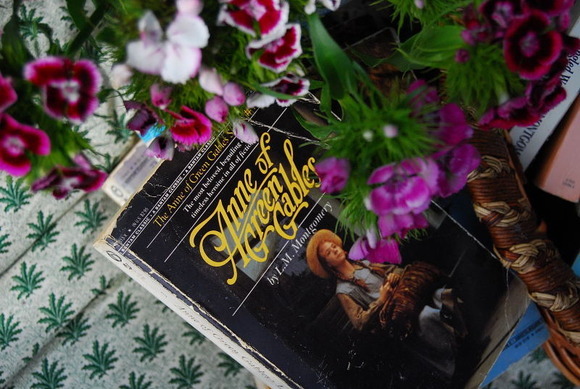 It was Anne of Avonlea, and once I read it, I was hooked for life. 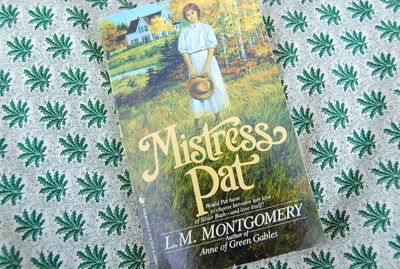 It became one of my childhood and teenager-hood passions~getting my hands on every L.M.Montgomery book I could find. The more famous ones were easy, but it took years to collect them all. Anne’s House of Dreams has some wavy yellow pages from me dropping it into a bowl of chicken noodle soup. It was always a thrill to meet a kindred spirit. My High School English teacher turned out to be one. She got excited one day when she saw me reading A Tangled Web, and asked to borrow it. I had found another Montgomery fan! Now that I’m older, I realize that I am by no means unusual in my interest, there are thousands and thousands of devoted fans. Are you one? 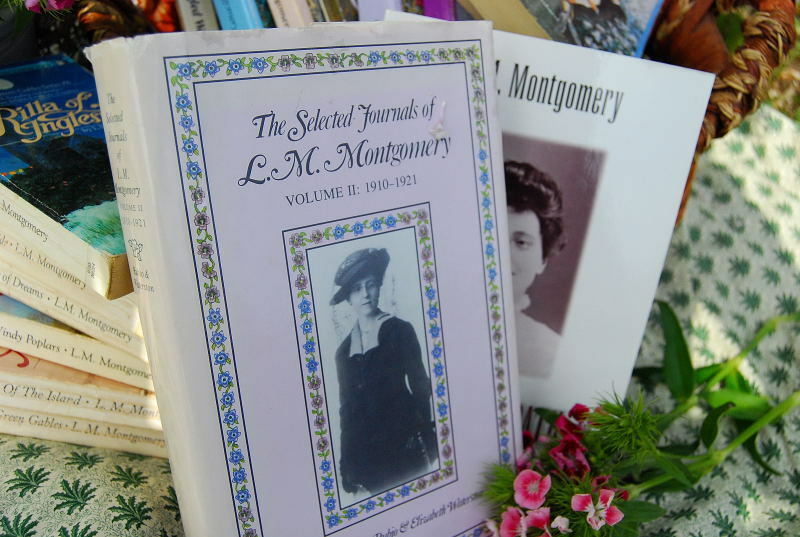 My latest purchase has been the Norton Critical Edition of Anne of Green Gables, and a used copy of one of Montgomery’s journals, which covers the years in which Anne was first published. The story of that little old lady does stop there. . . . .When I was a teenager, I went to her house one day to help her clean. The upstairs was full of boxes and old things. In one of the first boxes of books we opened, there on the top of them all, was an old 1911 edition of Anne of Green Gables. I gasped, snatched it from the box, and hugged it to my chest. (or, bosom, as Anne would say) I could not believe my eyes! She gave me the book, and it remains one of my prized possessions. It’s ironic that I don’t even know where it is right now. I just tore my room apart, looking for it. I think that I was so afraid of something happening to it that I packed it away. Yes, it will bug me to no end until I find it. When I do, I’ll be sure to take some pictures. L.M. 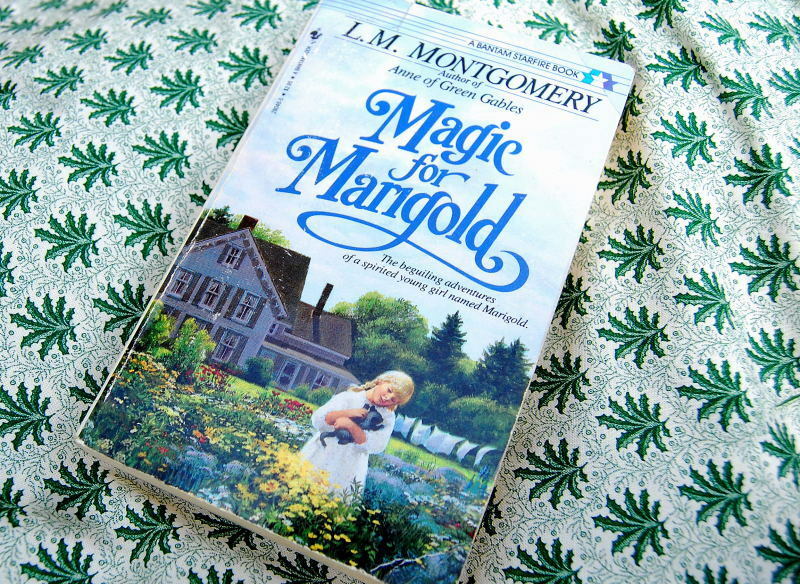 Montgomery’s books are all perfectly delightful, full of the beautiful (and not so beautiful) parts of life that we all enjoy~God’s creation, relationships (who can forget Mrs. Lynde, Marilla and Matthew, or Diana Barry? ), great humor, food, kitty-cats, quiet moments, childhood mischief, love, community spirit, and the fascinating times of a bygone era. ; (some for probably the 20th time!) It will be good for me, like visiting an old tried and truly trusted old friend~or cuddling in a favorite blanket with a mug of steaming tea. Calmness for my mind. They are the ideal books to take with you to your hammock under the trees . . . .
And, if you have a Grandma who loves to read, I would suggest giving her one (or more) as a gift! Good Morning Shanda….What a beautiful collection of books. 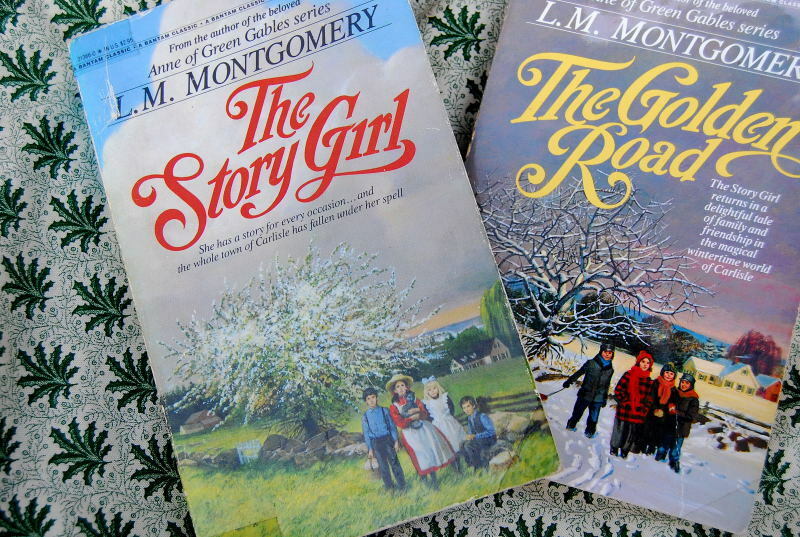 Funny I never did get reading the L. Montgomery books. But I think I will now!! There was a tv show on a few years ago “Anne of Green Gables” a Canadian show I believe. I have to admit because of that show I was not interested in reading these books. But that has changed. I’ve been reading your blog. I so love reading about your children and the funny things they do. My girls laughed at the “electric ears.” They wanted to keep going back to those pictures. It is so funny. Leslie when she was little got into baby powder. And we mothers know that when the children are quiet its best to check on them to see what they are up too. Well, thats what I did one day when it was quiet. I walked into a baby powder perfumed room and found a toddler covered in baby powder! And her footprints all over the place! I regret not having a camera. She was all white. Her tiny eyelashes were white, her hair had a dusting of white. White, white, white……..
You have a blessed day…..your writings here on your blog always inspire me, they make me happy, and I truly enjoy visiting. 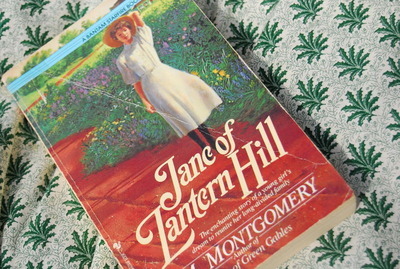 Oh, I felt kindred spirits with Anne and read the series many times in my ‘youth’. One of my friends even said I was just like Anne. I even made up a skit(green hair saga) that I did with my friend.I loved her imagination and the way she was enraptured with beauties of nature! My, lfe has changed being the mother of 6 boys who don’t care for “romantic” notions!I was in heaven when the movie came out. I felt it matched the book almost perfectly! Ihave never read any of the other L.M. Montgomery books, maybe they would capture my fancy as well! I adore L.M. 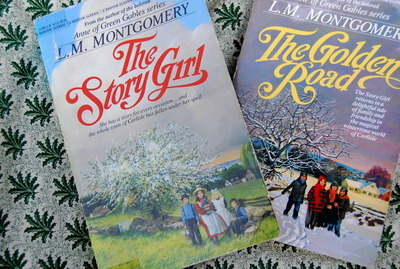 Montgomery’s work. I was homeschooled, and some of my required reading were the Anne books, the Little House on the Prarie’s and of course the Chronicles of Narnia. Those series are my all time favorites. I have to find those other books. I have never seen half of them. I also need to find the Little house on the Prarie books (resonably priced of course). This was a beautiful post. You know how much I love Anne…and I have read a few of your others. But I would love to read the rest. I know you had brought your Anne book with you on our get away. I’ll have to see if I can find them at the library – or e-bay maybe. Love You – my kindred spirit…and my bosom friend. My girls and I have read every single one we could get our hands on! My mother introduced me to the Anne books when I was quite young. I have quite a few but not all of LM Mongomery’s books. They are treasures. Did you like Before Green Gables? I think thats the title. I have never read any of hers, I know Juls will make her way over here and leave a comment. I loved the movies but just never read the books. I am also thinking of my friend Louise I am going to send her over here I think she would be a “kindred” as well! I just watched the movies–I borrwed them from Colleen–and it made me want to read the books. I couldn’t get into them when I was younger but I know I could now. Afterall I’m kind of a carrott top! I can relate! wow, the 20th time? Let us know how many of the books you make it through this summer. 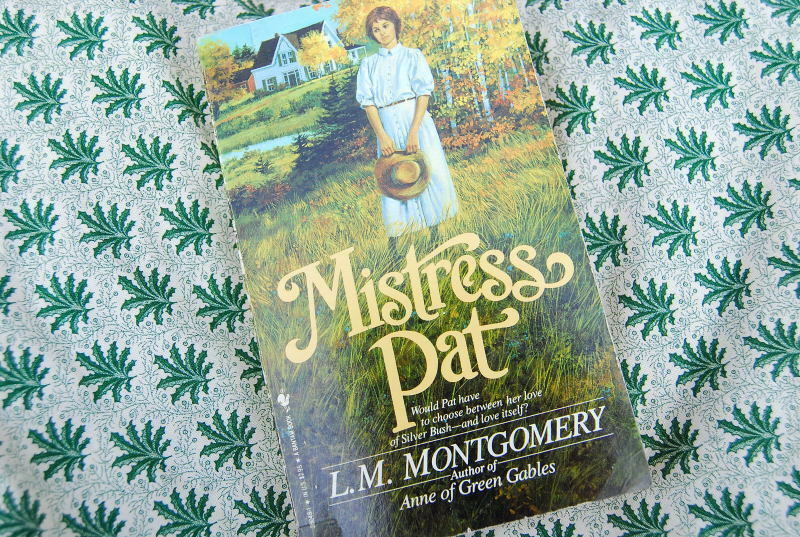 🙂 I was in Anne of Green Gables the play once…but I don’t recall reading the books….I just might pick one up soon though! Love it! I can’t wait to read them to my girls and have them read them themselves. That quote from her about Anne is just perfect. These are lovely pictures, by the way! You know how I love Anne, and all of Lucy Maud’s characters! I thought that I had them all, but I saw one in your pictures that I don’t have. I wonder if there are more that I don’t have. Something to research. 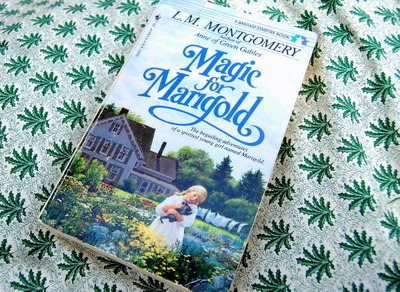 I was just thinking that I should read some L. M. Montgomery this summer! I mailed you a letter today. 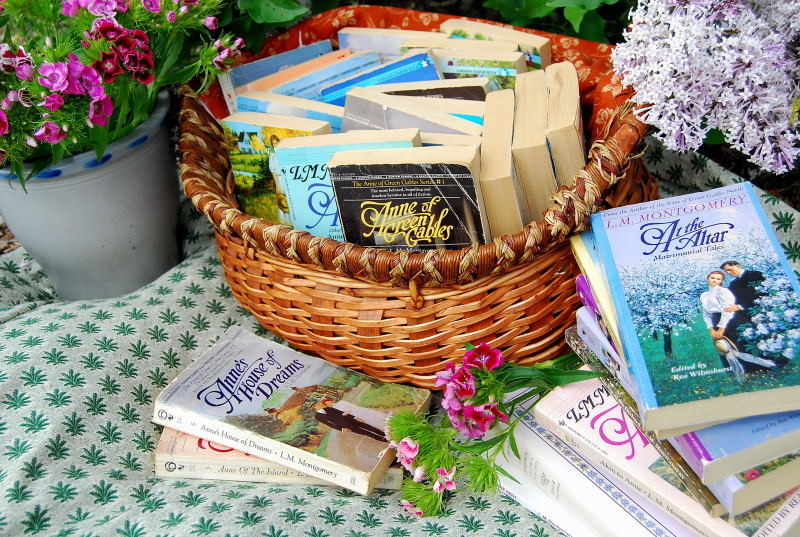 I love, love, love the Anne of Green Gables series!!!! I’ll have to look into other books by that author. I never thought about reading her other books. I’ve loved the Anne books so much! I love the basket full of books. Makes me smile. To be completely honest I have never read any of the books or watched any of the movies. Nate is always telling me how much he enjoyed them, we were just talking about getting some so I could read them. My very favorite books. I’m re-reading the Anne books…for I don’t know which time. I’ve probably read them all through at least 10 times. This post was so inspiring to me! It made me run downstairs and grab a few of my own L.M. Montgomery books! :o) I love the pictures too…you have a way of making things so cozy and beautiful! I enjoyed the story about the sweet old lady as well! The mental pictures that you paint for us all are lovely and always give me a little escape in the day…thank you! OH, my!!! This is Carilyn from mom3kids3cats! My husband had logged in and then when I went to put a post it posted under his name! Hahaha! Oops! He got the message back and was like…”What did you do?” Oops again! Anyways, this is going to show up under his name again…but just so you know…it is actually MOM3KIDS3CATS (Carilyn). Sorry if it was confusing! I didn’t even know that I had done it! My comment must have sounded kinda’ funny coming from a “guy” huh? Hhaha! My favorite books, by far! I fell in love with them in fifth grade. Time to pull mine out now. Have a wonderful day friend. I too am a collector of Montgomery’s works. I am missing a couple of her short story books, I think. It’s been a few years since I’ve put time into researching and looking for the ones I am missing. The cake recipe would be intersesting to see, although I think I’d use the vanilla too! As for soup stains…my copies have met the same fate. funny.. i just put a quote by her on my post last night. brought back memories seeing all these books here.. most of which i’ve read. was a huge fan of hers growing up and am excited to see my kate loving her work. in the little town where my husband is from in Can. they have Anne stuff everywhere in all the little shops – you’d LOVE it! Oh, I love Anne too. . .I used to imagine that if I had daughters I would name them for my favorite “characters” in books and/or movies. 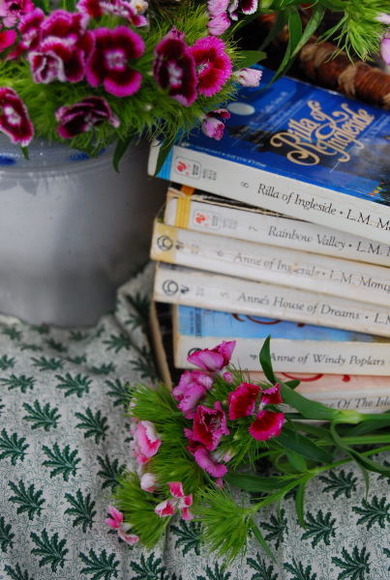 They would have been Laura (Laura Ingalls Wilder), Maria (Sound of Music), Anne (Anne of Green Gables), and Elizabeth or Lizzie (Pride and Prejudice). And just look. . .God gave me four sons instead!! 🙂 Maybe I’ll get a granddaughter one day named after one of these beautiful girls. . .